Queen Cleo’s grave in September of 2013. 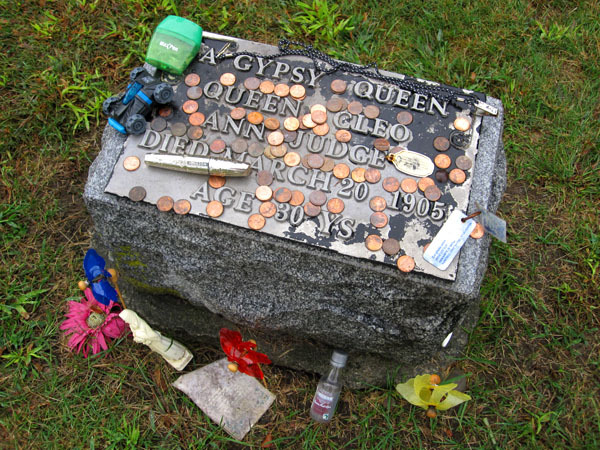 Most people in Marion have probably heard of the Gypsy Queen grave in St. Mary’s Cemetery. The grave, which is located in the section of the cemetery reserved for non-Catholics, is relatively easy to locate since it’s usually covered in pennies as well as other assorted trinkets. There’s also a wooden cross nearby, likewise adorned, and which is also part of her grave. According to local lore, leaving offerings at her grave will bring good luck while stealing from it will cause a curse to befall the thief. According to an article appearing in The Marion Star on March 20th, 2010, marking the 105th anniversary of her death, the Gypsy Queen was a woman named Ann Judge, called Queen Cleo by her people. She died in childbirth on March 20th, 1905, while traveling through Marion. The child also died. The article states that she was born Inie Driffhein, though presumably “Inie” was a misspelling of “Annie”. The article raises a few unanswered questions: Can we presume that Charles Judge was the father of the baby? Where is the baby buried? With Queen Cleo? 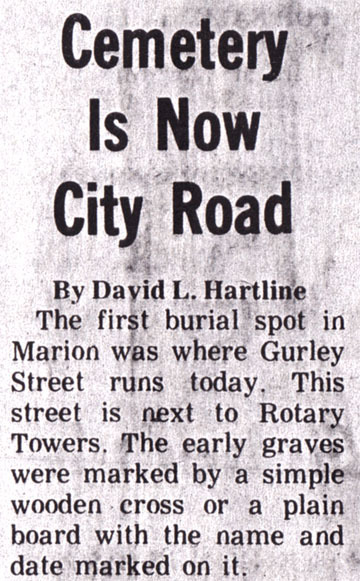 Local broadcaster Scott Spears, in discussing some of the lore surrounding Queen Cleo, mentions that she is rumored to be buried standing upright and that the grave is supposedly “covered with concrete because jewels were placed on top of her.” Whatever the case may be, her grave, along with the Merchant Ball, comprise two of Marion’s better-known oddball landmarks. In November of 1976, Marion City landfill workers unearthed fossilized woolly mammoth bones while digging a new disposal ditch. This is according to an article that appeared in the July 28th, 1977, edition of On Campus, a newsletter put out by OSUM. The city allowed OSU Geology professor Robert Wright as well as some of his students to excavate the bones, which were later carbon dated to be around 10,000 years old. The bones are now part of the Ohio Historical Center’s collection. Why is this find significant to readers of Spooky Marion? Well, a few years ago we published a story about the discovery of enormous bones in Marion County in the 19th century that were believed to have belonged to an extinct race of giants. However, a more likely explanation is that the bones were actually actually mammoth bones mistaken for human. Wonder how many other people have awesome fossils like this still in their backyards? We traveled from Parma to Waldo to the G&R to try their famous fried bologna sandwich. Pulling in at lunchtime, there was no place to park. To give you an idea….Waldo is Mayberry. The land that time forgot. It is a very nice, peaceful community. It has its own charm. Figuring it was 12:30 and lunchtime for everyone, we decided to go check Marion cemetery and check out the “haunted” Merchant grave. We went there and, although odd to be sure, it wasn’t anything really creepy. This is a HUGE place and we just drove around. I saw this grave site that was covered in gaudy trinkets and really…a lot of money. I don’t believe in ghosts or any hokey pokey stuff but hey….I still laid a quarter on the headstone before I knew why others have done it. It is an amazing story and worth the 25 cents I put on the headstone. By as much money and personal items left there…..who know 100 years later and people still leave stuff. Can’t hurt! I was born and raised in Marion, Ohio. I miss my old home. I lived at 478 Thompson Street. I lived at 400 Thompson, too. This house was haunted, but I loved it. Wish I could go home again. Now I’m in Piketon, Ohio. Thanks for the memories.